Bikers, visitors and residents enjoyed a day of nostalgia at Quenemo on Friday the 13th, remembering past motorcycle rallies held in the city in the ‘70s and ‘80s, which were shut down by the governor and highway patrol due to several deaths caused by violence and accidents. Above, the band Hansom Cabs, of Pomona, performs for a crowd gathered at the town’s community center. I had enough bad luck on Thursday that I wasn’t too worried about Friday the 13th. So I decided to visit Quenemo, once Kansas’ bad luck capital, for the motorcycle rally hosted by Quenemo PRIDE. 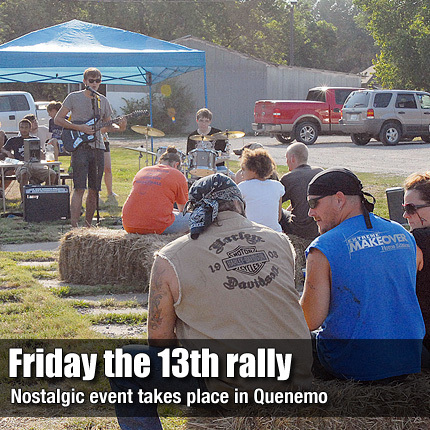 Labeled as a nostalgia event, it was planned not necessarily to glorify the days when bikers gathered in Quenemo on Friday the 13th to drink beer and have a rowdy time, but more as a celebration of what Quenemo could be again some day. As I drove into town, I could almost feel something was different from the last time I was there. It wasn’t just that some of the yards and streets had been spruced up because company was coming; it was more of a feeling that attitudes were changing, pride was starting to show again. I pulled up at the rally, where about 10 motorcycles were parked. I stood in the street and tried to imagine what it was like back in the ‘70s and early ‘80s when Quenemo’s population would more than triple on Friday the 13th with partiers outnumbering residents two to one. Several bikers fired up their cycles and roared up and down Main Street to add to the nostalgic effect. Friday’s rally didn’t have the crowd of those gatherings back then – small groups of people gathered in any shade they could find, some drinking beer despite the governor’s 1981 ban on open consumption of alcohol within the city limits, but most were talking about Quenemo. Many of the conversations were nostalgic. Several gray-bearded, tattooed guys talked about the good times in Quenemo. Those motorcycle rallies were fun for young bikers and their girlfriends. Usually it was a wild, drunken couple of days, with the most harm coming from intense hangovers for those who woke up in an alley Sunday morning to sounds of motorcycles roaring out of town. A married couple, who rode into town Friday on their cycle, told about their first meeting in the late ‘70s at Hazel’s, the bar and bait store up on the highway. Subsequent trips to Pomona Lake and Quenemo’s sporadic party led to their marriage 30 some years ago. Quenemo conjured up fine memories for them; it was their honeymoon spot. Some folks who had lived in Quenemo, but were too young to have been part of the old-time debauchery, told intergenerational stories about the incidents that finally forced the rally to end. The partying got wilder as time went by. Longhaired bikers urinated and worse in the streets and residents’ backyards, drunks climbed to the top of telephone poles and buildings, music blared all weekend. (It sounds kind of like today’s Country Stampede.) But also, a man was shot in the street, another fell off of the post office, yet another crashed his motorcycle, all ending in deaths. Quenemo was indeed unlucky for those people. The rally had turned unlucky for the townspeople, too. Many didn’t appreciate the wildness going on outside their homes all weekend long every time Friday the 13th rolled around. One young man told of memories of his dad placing shotguns by the front and back locked doors of their home, telling his mother not to open the door for anyone, except with shotgun in hand. The man admitted, though, that he was enthralled with the motorcycles lining the streets back when he was 6 years old; years later he was finally the owner of a Harley-Davidson. Wearing a vintage Sam’s Saloon T-shirt from the February 1981 event that never happened, he was fulfilling a childhood dream of attending the rally on his own bike. Although the main local business, the saloon, was the lucky recipient of the money that poured into town during those times, the ordinary townsfolk suffered during the weekend event. So on Feb. 13, 1981, the governor and the highway patrol decided enough was enough, blocking entrance into the town to all but residents, and declaring no alcohol could be sold or publicly consumed. That action meant death for the rally. One man, a former resident of Quenemo, having moved away 10 years ago, said the end of the event signaled the death of the town. “This town is dead,” he said, standing in the shade of the city park’s new picnic pavilion. While the former resident predicted the town would waste away without some type of new businesses, others spoke about how the event foretold a more lucky future. What the man didn’t understand is that businesses do not make a town, people make a town. And people will determine whether their town will live or die. It all depends on whether they are proud of where they live and if they are willing to work to make their home a good place to live. Some conversations, especially among those noticeable in their PRIDE T-shirts, were not as nostalgic as they were optimistic. They talked about how the first “official” rally in 32 years had brought people to town, although not the 1,000 bikers as in the past. Children played games and had their faces painted; adults partook in the fundraiser supper, sat on hay bales, listened to bands and enjoyed the hot July evening. That people had shown up in downtown Quenemo indicated an interest in the town that had waned over the years. Other activities hosted by the PRIDE group, now one year old, have also been successful. Following on the heels of last Friday’s event, the group is offering a Christmas in July event this week, modeled after the successful gift giveaway held last Christmastime. Some lucky kids will be the recipients of school supplies; lucky grandparents will smile because they can give otherwise unaffordable gifts. The community is helping itself and it shows. Just like the town, people make their own luck. And Quenemo is beginning to look lucky again, no matter what day of the week it is. For the complete story, subscribe to the print or online edition of The Osage County Herald-Chronicle at www.och-c.com/subscribe.html.